An ongoing debate rages regarding the health effects of coconut oil. This oil has been said to possess various health benefits, but it is also very high in saturated fat -- a type of fat linked to coronary heart disease, according to the American Heart Association. While coconut oil may possess certain heart-healthy benefits, consuming large quantities may damage your health. Many health professionals don't consider coconut oil unhealthy per se, but they do recommend consuming it in moderation. According to nutrition expert Dr. Michael Greger, because coconut oil is very high in saturated fat, it can significantly worsen bad cholesterol levels. He also notes the connection between high cholesterol levels and heart disease and therefore does not recommend a diet rich in coconut oil. The Cleveland Clinic notes that olive oil is a healthier choice than coconut oil because it does not raise bad cholesterol. 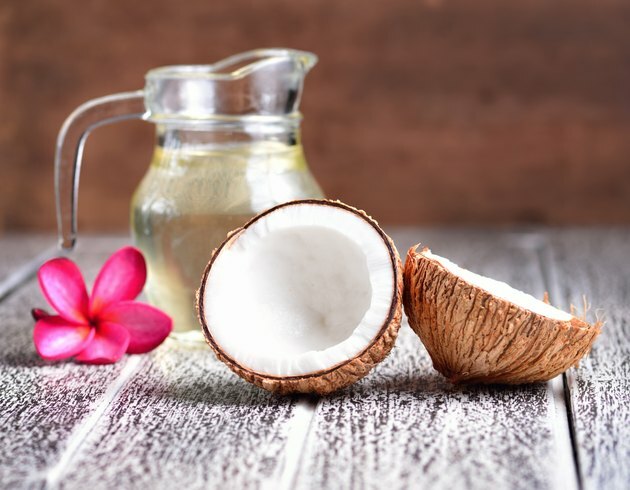 While coconut oil is composed of approximately 90 percent saturated fats, New York University Langone Medical Center notes that the majority of these fats are medium-chain triglycerides. According to the medical center, these kinds of triglycerides are used as energy by the body rather than being stored as body fat. Therefore, some scientists argue that this type of fat is less damaging than other saturated fats, such as those found in animal products. Dr. Walter C. Willett acknowledges on the Harvard Medical School website that the high levels of saturated fat in coconut oil can raise low-density lipoprotein, or "bad" cholesterol. But Willett goes on to say that in addition to boosting LDL, coconut oil is especially good at boosting high-density lipoprotein, or "good" cholesterol. This effect is likely due to a type of fat known as lauric acid, which makes up about half of the saturated fat in coconut oil. In addition, Willett says that because coconut oil is a plant-based source of fats, it also contains substances that have beneficial health effects, including antioxidants. On the Center for Science in the Public Interest website, Frank Sacks, professor of cardiovasular disease prevention at the Harvard School of Public Health, notes that just because coconut oil increases HDL along with LDL does not necessarily mean it's healthy. According to the Cleveland Clinic, more research is needed to investigate the claim that coconut oil is not harmful because it boosts the two types of cholesterol. Regardless of the many health claims made about coconut oil, some professionals, including Willett, contend that coconut oil is less healthy than vegetable oils, such as olive oil and soybean oil. NutritionFacts.org: Is Coconut Oil Bad for You? What Are the Benefits of Palm Kernel Oil?